An article in The Independent last week stated that at least 19 UK-based front companies were being investigated on suspicion of being part of Europe’s biggest money-laundering schemes, designed to make £12.5 billion of ill-gotten gains look like it came from legitimate sources. It accused Britain of having “lax corporate rules” and protecting company directors’ anonymity, to the point which the country has become Europe’s ‘money laundrette’. The issue of money laundering is complicated, and the criminals involved in these scams are quick, ruthless and clever. Certain businesses need to be astute and have clear due diligence processes in place when taking on new clients, as the maximum sentence for the crime of money laundering is high. In this week’s article, I will explain what money laundering is, what a regulated businesses’ compliance requirement are under the Money Laundering Regulations 2007, and finally, how you can protect your business from becoming a haven for criminals to utilise in order to ‘clean’ their money. 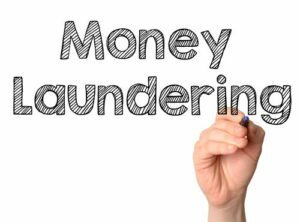 Put simply, the activity of money laundering involves making money that has come from illegal sources appear to have been garnered from legitimate transactions. The scam identified in The Independent article involved the creation of two front companies in the United Kingdom who, after carrying out fake business transactions between themselves, sued each other in a Moldavian court for millions of pounds worth of unpaid loans. The court then awarded payment of the loans to the claimant company (thereby providing a court order document which gave legitimacy to the bogus loans). Dirty money is was then moved from Russia to the UK front-company’s accounts in Moldava, then onto Latvia, a country whose banks operate within the EU regulated banking regime. This final step added to the legitimacy of the funds. Complicated, clever and cunning. And it happens all the time, all around the world. The professions that carry the largest risk of allowing money gained from illegal activities to enter the UK financial system are lawyers, estate agents and the financial industry itself. Although Swiss banks, which guaranteed depositors secrecy, was for decades the money laundering refuge of dictators, despots and financial deviants, now London’s luxury property market provides a clean investment portfolio for criminals. Even the world-renowned UK private school system has become the unwitting recipients of laundered cash. So what is the basic law around allowing ill-gotten profits through your business and into the UK financial system? The Money Laundering Regulations (MLR) 2007 (as amended) apply to certain professions in the UK that are susceptible to money laundering. The Regulations set out the standards of due diligence and the ongoing compliance required by these businesses to ensure their clients are not bringing dirty money into the UK financial system via the regulated organisations. To comply with the MLR 2007, these institutions must appoint a relevant person to perform due diligence in cases where a new client is taken on and they suspect that a client could be involved in money laundering, or doubt the authenticity of the client’s identification documents, or the client is instigating a one-off or series of transactions exceeding the value of £15,000. The businesses concerned are also obliged to perform due diligence on their existing customers if the business relationship or the transactions they are involved in deems it appropriate. a) Check the client’s identity by asking for their passport or other government issued documents. You may also wish to use an independent electronic verification service which may help mitigate your company’s risk. However, these databases will only verify that a person actually exists, not that the person claiming to be that particular person is not, in fact, that person. c) You must obtain information about the nature and intended purpose of the business relationship between you and the client. This includes where the money to fund the transactions is coming from and the purpose of the transactions themselves. b) As these regulations have been in force for over seven years and applicable in one form or another within other legal jurisdictions, most people are used to being asked for identification and proof of address etc when entering into a new business relationship with one of the professions subject to the MLR 2007. A financing credit company is embarking on a banking relationship with an organisation outside the EEA. Under Regulation 20 of the MLR 2007, organisations who are regulated by the MLR 2007 must appoint a relevant person, or a Money Laundering Reporting Officer (MLRO) who will have ultimate responsibility in ensuring due diligence processes are carried out and staff are adequately trained to implement the required procedures. Any employee who suspects a client may be involved in money laundering activities has a duty to report their suspicions to the MLOR. The maximum penalty for failing to comply with the MLR 2007 is two years’ imprisonment, a fine or fine and imprisonment. However, if the relevant person took all reasonable steps and exercised all due diligence to avoid committing the offence, they are likely to have a strong defence in their favour. Now you have the knowledge of what is required of businesses regulated by the MLR 2007 to ensure their clients are not laundering money, here are some practical steps you can take to ensure that your business practices are compliant with the law. Make sure all your staff, from interns to senior executives have the confidence to speak up if they have any suspicions about a particular client. This is particularly important when it comes to ongoing monitoring of clients and new staff. A fresh pair of eyes can often spot anomalies which can go unnoticed by long-term members of an established team. An example of this is where one of my clients employed a junior accounts clerk who subsequently discovered that a senior staff member within the company had been defrauding the business for years, to the tune of around £2 million. Follow a due diligence checklist applicable to your profession and ensure you comply with the record keeping requirements under the MLR 2007 such as keeping a record of a new client’s identity for five years after the business relationship or transaction ends. Get professional advice on how to correctly set up your due diligence practices and procedures so you save time and money by having the correct processes in place from the outset. Protecting your business from money launderers can seem a daunting task. However, authorities do not expect you to be an expert in detecting fraud, only to comply with the correct due diligence procedures set out within the relevant legislation. If you need advice pertaining to complying with the MLR 2007 or setting up proper due diligence practices and training then you can read more information here. Do you have any compliance tips you can share with our readers? If so we would love to hear about your due diligence compliance procedures, and how you make them more efficient. Please feel free to pop your thoughts in the comments section below.